Mmmmm goat cheese <3 .. So last summer I went to a Dogfish Head beer dinner and one of my favorite courses was the appetizer. They had a goat cheese salad with peaches and a raspberry vinaigrette and paired it with Festina Peche. The warm goat cheese with the peach and the sour beer. So good. I love goat cheese with fruits so when I saw the cheese and the raspberry ale in my fridge, I decided to use the beer as the fruit in my salad. I heated the beer in a pot with some sugar and honey to get a more concentrated flavor of raspberry. Then I mixed in some olive oil and balsamic vinegar. Breaded and cooked the goat cheese. Threw in some toasted walnuts. Delicious. Cut the goat cheese into slices. Press into the shape you want. Beat the egg with a little water. Coat the goat cheese in the flour, then the egg wash, and then the bread crumbs. Place them in the refrigerator while you make the vinaigrette. For the vinaigrette, bring the beer, sugar, and honey to a boil in a pot. Turn the heat to medium and cook for about 5 minutes. Pour into a bowl and mix in the oil, vinegar, and salt. Heat some butter on a pan and cook the goat cheese on both sides until browned. Toast some walnuts on the pan. Now just put all the ingredients together on your salad. Season salmon with some salt and pepper and wrap it in aluminum foil. Bake at 350 degrees for 10 minutes per inch of thickness, until it is opaque. Once the fish is finished cooking, use a fork to flake it apart into a bowl. Mix in the rest of the ingredients, and serve with some toasted bread. I went to Cigar City in Tampa last weekend with some friends. My boyfriend and I brought back a few beers from the trip, including a growler of their Oatmeal Raisin Cookie Brown Ale. With a taste that is just as the name suggests, I felt like I had to make a dessert with it. I considered cookies but decided ice cream would be a great way to show the flavor. This is an easy way to make ice cream and you don't need an ice cream maker. It turned out very yummy and the beer's flavors come out strong in the final product. As I opened the bottle of Brooklyn Brown Ale and smelled it, all I could think was that this is an ingredient. I don't know how it couldn't be. People that aren't using beer as an ingredient are missing out. 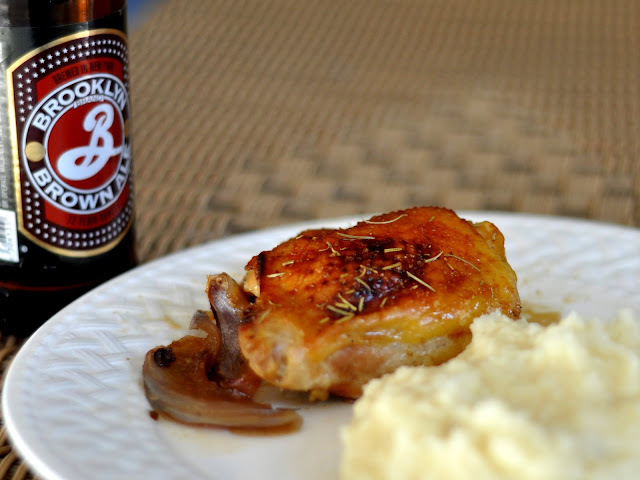 Brown ales are a great choice for cooking. I decided to make chicken baked with the brown ale, brown sugar, honey, and some vegetables. The nutty, roasty malt flavors from the beer work perfectly in this recipe. Season the chicken with salt, pepper, garlic powder, and rosemary. Arrange the chicken onto a baking pan. Add the honey, brown sugar, soy sauce, and beer, rubbing everything onto the chicken. Reserve some of the beer to add about 45 minutes into cooking it. Chop the onion and tomatoes into a big chunks and add them into the pan. Cook at 370 degrees for an hour.